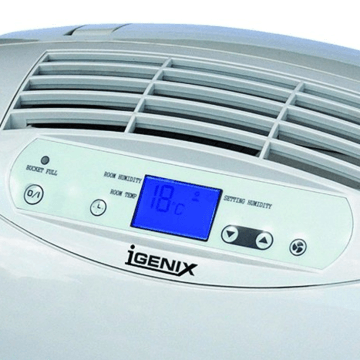 The Igenix 20 Litre IG9800 dehumidifier recently shot up the sales charts (Autumn 2014) and so we just had to review it. In a market that otherwise is fairly steady it’s great to see a relatively new competitor come to the fore. We recently gave the Igenix 20 Litre’s biggest competitor, the EcoAir DC202 our first ever 5-star rating, so it’s going to have to be very good to impress. The Igenix 20 Litre features a detailed LCD display that shows all the current settings and is driven by the surrounding buttons in a similar way to microwave cooker displays are controlled. 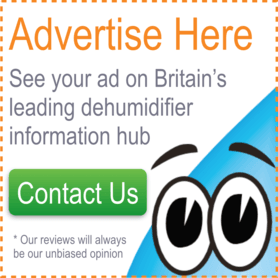 This is different to most dehumidifiers out there which tend to be controlled through menus of LED lights, which we find easier to understand, but not as fancy. It also displays the current room temperature and relative humidity, which is a great addition for curious minds. Surrounding the screen moving from left to right, above the on/ off switch is the ‘tank-full’ indicator, which illuminates when the water collection bucket is full. 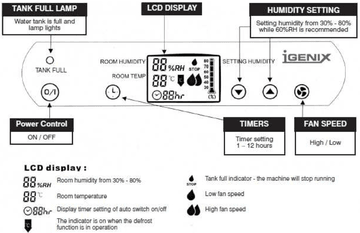 The machine does stop dehumidifying when the tank is full, and there’s a symbol on the LCD display that shows this too. The next button is the timer button. 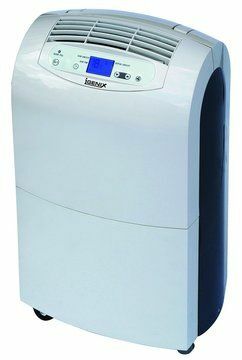 The timer of the Igenix 20 Litre is settable between 1 to 12 hours, which is a greater time span than most dehumidifiers and a great way of saving energy if you don’t want to use the machine on a continuous basis, say for drying laundry or to clear morning condensation. To the right of the screen are the humidity controls, with the humidity being settable between a bone-dry 30% to a humid 80%. The majority of the time I’d suggest that 50%RH would be about right, but it may be worth dropping down to 40%RH when it gets below 5°C outside. 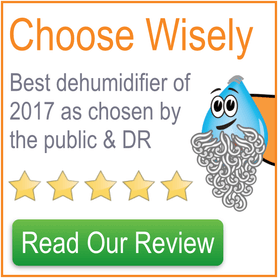 It’s great that the Igenix 20 litre gives you this broad range of dehumidifying options, rather than being limited to a simple one, two or three droplet setting as seen on many other dehumidifiers. The furthest button to the right of the control panel controls the fan speed, of which there are two speeds selectable, which is fairly standard in the market. I would think the lower of the two speeds would be the one in use for the vast majority of the time, with the greater of the two speeds in use to dry laundry faster or possibly after a flooding event. There are no ‘laundry’ or ‘boost’ modes with this model, although arguably the second fan speed and the ability to set 30%RH could do this job. There is also no ability to change the angle of the air outflow as seen on competitor models. Disappointingly there’s also no air purification system like an antibacterial filter or ioniser, only a simple dust filter. Maybe this was a cost/ price-saving measure. What is great with the Igenix 20 Litre is the massive, 6 litre water collection bucket, which literally dwarfs any others currently on the domestic market. This will greatly reduce the number of emptying trips you’ll be needing to make, particularly when compared to other 20 litre machines that only have a 2 litre bucket! In case you’re lucky enough to be able to site the dehumidifier above a sink, there is also a continuous drain ability. It’s pretty awkward to fit it as you have to thread the 13mm pipe in from the hole on the side to the drainage point. Frustratingly Ingenix did not supply this pipe in the box. It weighs in at 14.2kg unboxed, which is a lot, although not too extreme for the more powerful domestic refrigerant dehumidifiers. It has the largest dimensions of almost any domestic dehumidifier on the market, being 27cm deep by 61cm high by 39cm wide, making it awkward to carry and move around. Thankfully the model is mounted on wheels so it’s not necessary to lift it to move it and there is a top-mounted handle should wheeling it not be possible. With it being so large, the Igenix could never be described as discreet. However, the silver panels are a welcome departure from the standard ‘appliance white’ colour of other models and the black side panels break up the silver a bit too. The control panel is easy enough to read and use after a few glances at the instruction booklet. Overall the quality of the materials is not the best, but it’s not the worst either. This is an area that lets the model down somewhat, particularly on the higher of the two fan speeds, where I’d echo some of the harsher customer complaints that describe the unit as sounding like a jet is taking off. The vast majority of the sound seems to come from the fans, rather than from the compressor. However, the vast majority of the time the lower of the two fan speeds would be more than sufficient and this is thankfully much quieter. Ingenix quote the model to produce 47dB, which is a little louder than some similarly powerful competitors. Even on the lower of the two fan speeds, you would not want this switched on in the bedroom or the room that you watch television in. This Ingenix model is rated to extract 20 litres per day, however note that this extraction was measured at 30°C and 80% relative humidity, which are conditions way outside of what we’d expect to see in UK homes. In fact, Ingenix told us that if you changed these conditions to 27°C and 60%RH, you could expect to extract 10 litres per day, a big drop. Under normal UK conditions the Ingenix will extract a few litres each day once it’s ‘bedded in’, so you can expect to empty that enormous bucket once every one or two days. Considering it’s power, we’d rate the Ingenix 20 Litre as suitable for up to a maximum of a 4 to 5 bedroom home. Our feelings of the Ingenix 20 Litre were mixed and so you’ll want to be extra careful to not overpay should you choose to get it. The best price we found was at this shop, so check that out if you’re thinking about buying this particular model.